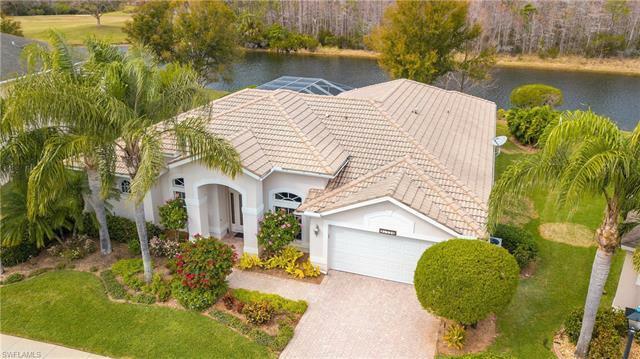 TURNKEY...This stunning Arthur Rutenberg floorplan Home was built and well-maintained by the current owners in the very desirable golf community of Stoneybrook. It offers more than 2, 500 square feet of living area with 4 bedrooms plus a den and 3 bathrooms.The very low HOA fees include many resort-style amenities. Enjoy golf without having to pay a golf membershipâjust pay as you go. Ideal setting for families of all ages. From the moment you enter the sunlit interior of this house, a sense of calm prevails. The layout is ideal for both entertaining and comfortable family living. The huge great room has a built-in Bose surround sound system, the kitchen area has a cozy breakfast nook. The fourth bedroom has a bath with pool access. It can be a rec room or mother-in-law suite. The spacious patio has just been rescreened and the pool deck resurfaced. Conveniently located to shopping, fine-dining, sporting events and entertainment, itâs across the street from Miromar Outlets, and Hertz Arena and close to Gulf Coast Town Center, Coconut Pointe Mall and FGC University. Itâs 10 minutes to the Ft Myers international airport and approximate 15 min to the renowned Bonita Springs beaches.